Having grown up close to the ocean, boats were part of the landscape. Most of my boating experience, however, was on the many nearby ponds, streams and rivers. Along with my brothers and friends, I would navigate the various fresh waterways in search of good fishing. Once a good spot was found, nothing was more important that having a good anchor, because if there was any wind on the pond or current in the river the boat would quickly drift off the spot and you’d spend most of our time back-rowing instead of fishing. The anchors we used were not of the store-bought variety. We would just find something heavy enough that we could tie a rope to and that was that. 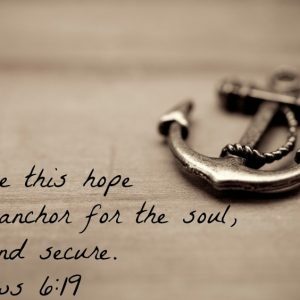 The writer of the book of Hebrews speaks of our hope in God and His promises to us as “an anchor of the soul.” This is a wonderful picture to help us visualize this important Biblical truth. Without such hope in God and His promises to anchor our soul, we would drift from the place of God’s blessing into dangerous waters. It is our hope in God, that He is faithful to His people and that He will come through for those who wait upon Him, that anchors our soul “sure and steadfast.” Remember, hope is directly tied to belief and faith. When we believe God and His promises and place our faith in the same, hope springs up in our hearts. The more steadfast our belief and faith, the greater our hope — it’s just that simple. And where there’s hope, there will always be joy. So, if you find yourself drifting, check your anchor.